Disclosure: This Covergirl Voxbox was given to me complimentary from Influenster. Provided I give an honest review. Hello there Loverlies! I was so happy when I heard I was one of the chosen lucky folks to try out the Covergirl VoxBox! I haven't had a chance to do a Voxbox in a good while. So I was excited when I got the email showing I was getting this Voxbox. The two items I got to try were Covergirl's Plumpify Blastpro by Lashblast Mascara in very black and their Colorlicious Oh Sugar! Vitamin Infused Balm in Sprinkle. I was hoping to give the mascara an amazing review, but when I tried it on, it just felt and looked like any other mascara that I have used. It is a nice mascara, but I prefer smaller brushes. The huge brushes I find harder to apply the mascara neatly onto my eyelashes. 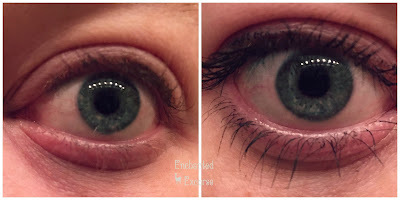 I really didn't see any huge difference in volume compared to my Almay mascara. If you want to try it out for yourself click HERE. On another note the lipstick I found very refreshing! It is very moustourizing and feels awesome on my lips. I am happy the color I was randomly given actually looks good with my skin tone. I may not have enjoyed the mascara, but I will say the lipstick is worth purchasing. If you would like to try the lipstick out for yourself click HERE. Excuse the blurry lip pick.